In the lecture, Prof. Geige systematically analyzed a variety of legal norms from different jurisdictions that may enable transformative use of the copyright works. He also used a couple of leading cases from Germany, France and USA to illustrate the possible legal solution for reconciliation of copyright with freedom of creation of derivative works. Meanwhile, he insightfully proposed to make pervasive reform on copyright system and to establish the so-called solicized mechanism for copyright interest negotiation, communciation and clearance. 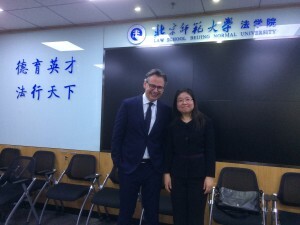 Prof. Xue praised the thoughtful research of Prof. Geige and mentioned her own publication on the similar solution. On the other hand, Prof. Xue raised the caveats of the proposed reform and new mechanism, such as potential conflict with moral right, institutional defects for large-scale socialized collective management. 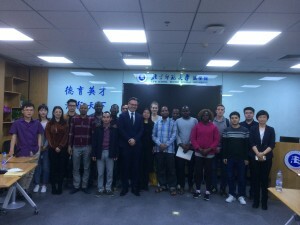 BNU post-graduate students and international visitng or exchange students from more than 20 countries and regions (such as Tanzania, Togo, Hungary, UK, Scotland, Belgium, Pakistan and China) participated in the Lecture and engaged in the active discussions with Prof. Geige.